We always have difficult starts after a night in a Walmart parking lot. Perhaps it’s the curse of corporate America. Today was no exception as we grumbled with one another over plans and bad internet connections. Finally we set ourselves on a positive course after reading an interesting set of articles in the Southwest travel section at about.com. 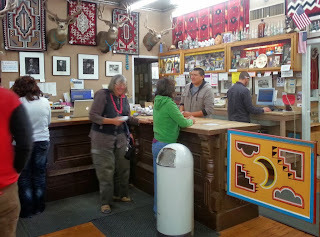 An article on the role of trading posts in Native American culture prompted a visit to the famous business cited in the article, and we had a great time picking up a gift for Colleen’s birthday, made by a woman from the Zuni Pueblo. The article we read on the Acoma Pueblo reinforced our desire to include a visit to this amazing place on today’s agenda. Touted as the oldest inhabited community in North America, this collection of homes and religious buildings are clustered on the top of a tall mesa. Originally only accessible by steps cut into the rock, the pueblo now has a curving access road that brings water and propane and removes porta-potties and tourists at the end of the day. The Acoma have developed a great approach to tourism, with a museum below and a shuttle to the top. Guides accompany visitors everywhere and your camera carries a permit. As you wend your way through the stone and mortar structures there are occasional folding tables draped in colorful blankets and rugs, and covered with hand painted pots, beaded jewelry, sketches or sculptures all made by the local people. There was even a bread vender selling the distinctive round loaves baked in outdoor stone and clay ovens. 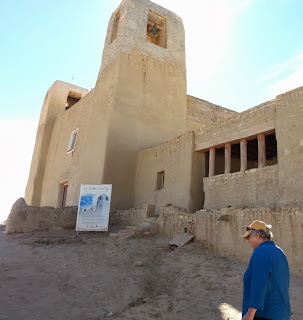 Our Acoma guide was well versed in the history of his people. Stories of the Spanish inquisition were of the worst sort and the oppression of the Acoma people was heartbreaking. 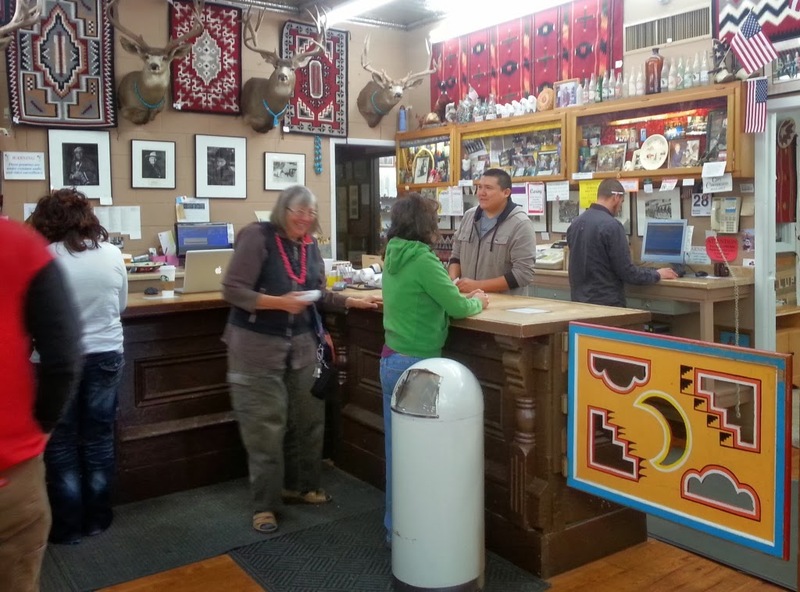 But the adaptability of the Acoma was inspiring and their creativity, which extended beyond the beautiful art work to historic community ventures resulting in the preservation of their culture, was heartwarming. When the ceremonial round kivas were destroyed by the Spanish, they were re-built, not round, but square looking exactly like the houses to the invaders, but with subtle differences obvious to the Acoma. Today every infant born into the tribe is ceremoniously carried up the original steep stone steps and has his or her feet touched to the ground at the top in recognition of connection to the earth of the mesa. We were moved by this experience. It was a good day.